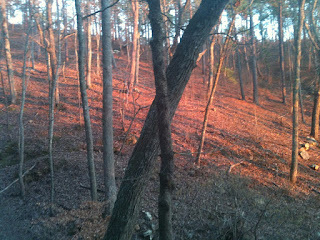 We were fortunate to be in a stand of pines today at sunset. The dead fallen needles are resurrected to life by the westward falling sun. They produced a somber orange amber that transitioned to burnt red. Giving life to a woodland fire that didn't exist.